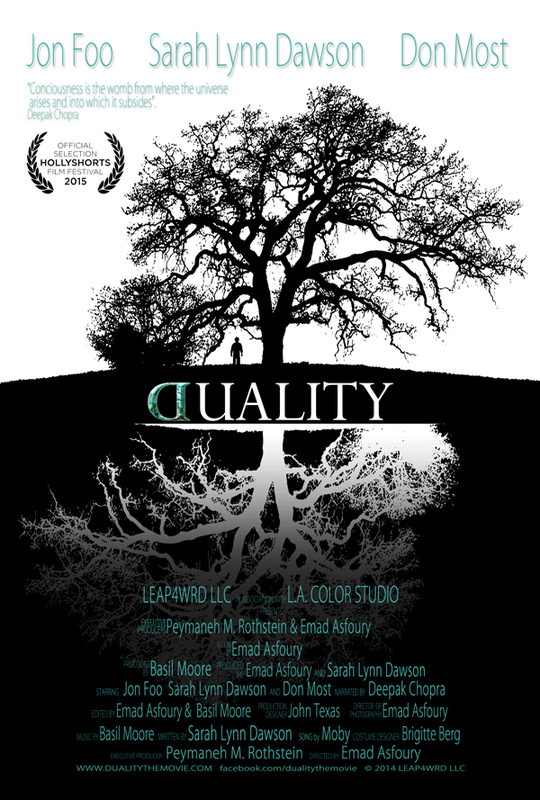 Duality is a film about a man who is traveling between different universes against his will. Through his experience and struggle the film looks at the power of choice and his inner and outer conflict with dual realities. The film is made as visual poetry and also touches on theories of consciousness, space/time, and quantum physics. Duality is Narrated by Deepak Chopra featuring the poetry of Rumi. The film is directed by Emad Asfoury. Written by Sarah Lynn Dawson. Executive Produced by Peymaneh M. Rothstein. Produced by Emad Asfoury & Sarah Lynn Dawson and Basil Moore. Starring Jon Foo, Sarah Lynn Dawson and Don Most.